As an opportunity to explore the play of the natural within the artificial, we constructed a three-dimensional steel matrix inset with panels of living mosses and enclosed within by translucent volume. The matrix emerges from the walls and hovers over a groundscape of recycled rubber, which is as springy and giving underfoot as the mosses are to the touch of a hand. The spatial configurations of these verdant planes vary in size, height and proximity to the visitor, thus creating a range of possible encounters. There is no designated path to follow, but instead present a space to explore where the underside is as telling as the topside. 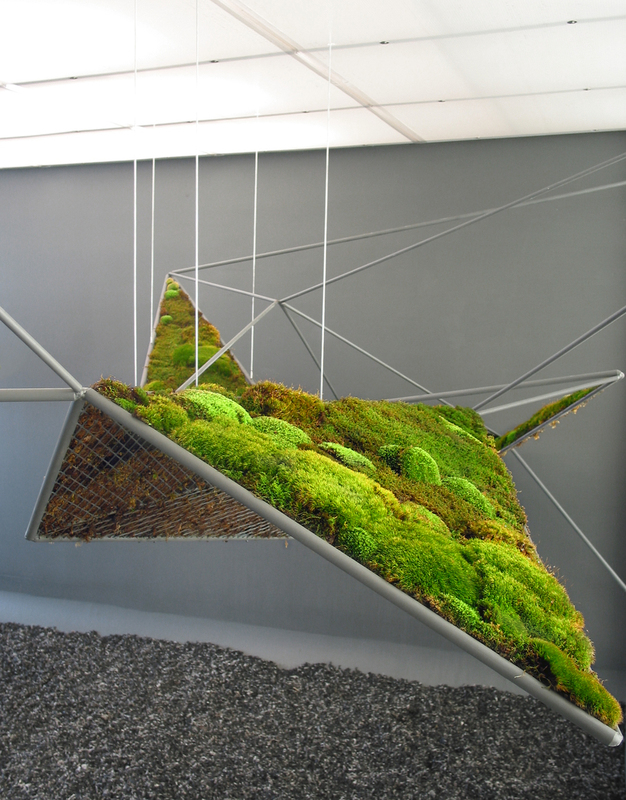 MoistSCAPE allows visitors to experience the play in scale from the miniature of the floating mossy landscape to the actual one of the installation as a whole. Exhibited at the Henry Urbach Gallery in New York NY, from June 1 to July 30, 2004.